A Santa Christmas Card with a choice of three messages. Ideal to use as a Christmas craft activity. Children decorate their cards then write a message to a family member or friend. Provide the children with a Christmas Card Template. (Children can choose a card with ‘Merry Christmas’, ‘Seasons Greetings’ or ‘Happy Holidays’ as their message). Ask the children to decorate their card and write a Christmas message to a family member or friend. 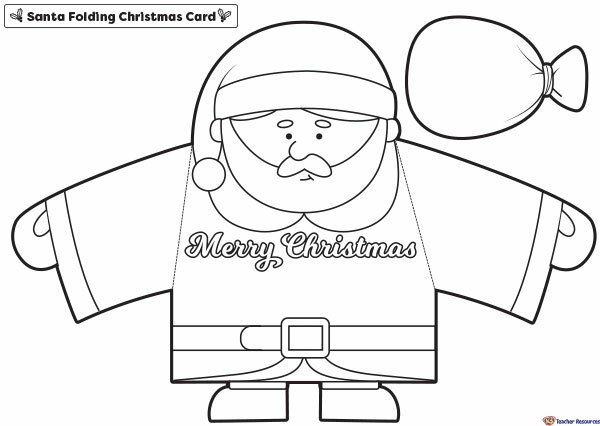 Ask the children to cut out their card and fold in the arms to create their expandable Santa Christmas Card. Attach Santa’s sack to one of his hands with glue. What comes next? – The children can create an envelope for their card and give their card to their chosen family member or friend.